I watched the heaving black mass for a minute. Shuddered a little and averted my eyes, hoping I’d imagined it as I slowly turned back. Alas, no. There they still were, running the chive gauntlet, acting all busy like. Busy with what you say? Sucking the life out of my chives it seems. My tiny potted permaculture garden had been doing reasonably well, condsidering all the growing conditions. At a distance everything looked pretty healthy and well tended. Up close, it was a little different though. The mint was munched, the lemon balm looked a touch fried and the chives well…were a black heaving mass. A black heaving mass of which I wanted no part of. I noticed them, I observed them, I squished them between my fingers, I thinned the chive cluster out a little, I squirted high powered water on them. They seemed to love every second of their well tended honeymoon and bred like bloody aphids. I watched a little more, the ants below ‘farmed’ them, making sure they were ok, feeling loved and nurtured. No more, I muttered, it’s you or me… and quite frankly, well it really has to be you. I pulled them all out, bar a few sad loners that the aphids weren’t partying on yet. My perfectly balanced permaculture pot was now looking a little unbalanced. But at least the black heaving mass was disrupted and I could once again think about eating chives without wrinkling my nose and furrowing my brow. tip out on to a lightly floured bench top and knead quickly with finger tips, pulling it together to a light dough. This entry was posted in Food Glorious Food and tagged aphids on chives, baking, biscuits, black aphids, gardening in pots, organic gardening, permaculture, simple, sour cream and chive scones, sourcream and chives by cityhippyfarmgirl. Bookmark the permalink. 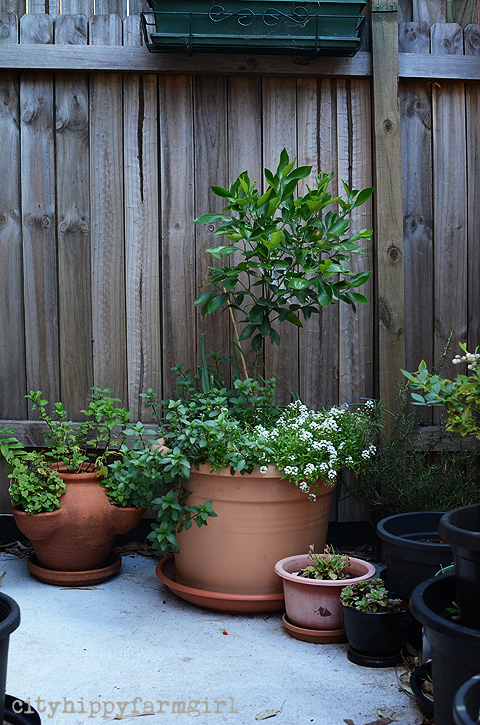 Considering the teeny tiny garden space I have…yes, but still an absolute jungle! Yeah, I did the same last year – I got sick of reapplying soapy water to temporarily dampen their party, only to have them back within a couple of weeks. Fingers crossed it doesn’t happen this year! I wonder what’s so appealing about the chives? I found that if you plant Yarrow nearby, the aphids like that more so than the chives! Of course for me, Yarrow is a favorite herb and I had to do battle with them for that reason and the chives were fine! I’m not familiar with yarrow at all and just looked it up now…Nose Bleed Plant, quite an alternative name. How do you personally use it? Cooking or medicinal? The weather is so up and down at the moment isn’t it, your way would be even more so than here. There are definite downsides to gardening sometimes. 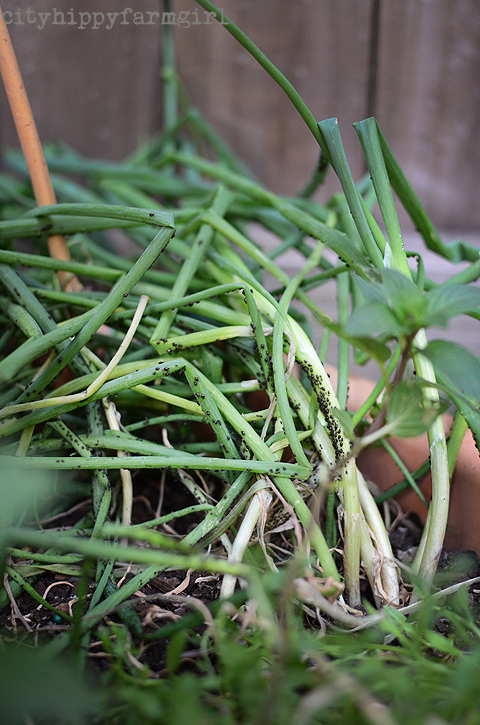 Watching your produce being eaten by bugs is one of them! I’m glad you’ve won (for now anyway!) and these scones look like just the way to celebrate. your most welcome BM. Hope you all like them. Urgh – that happened to my chives last year. The WHOLE plant was literally a black heavy mess. So gross. When I was googling my problem, yours actually came up too Miss Piggy. Ick! Did you grow them again since? 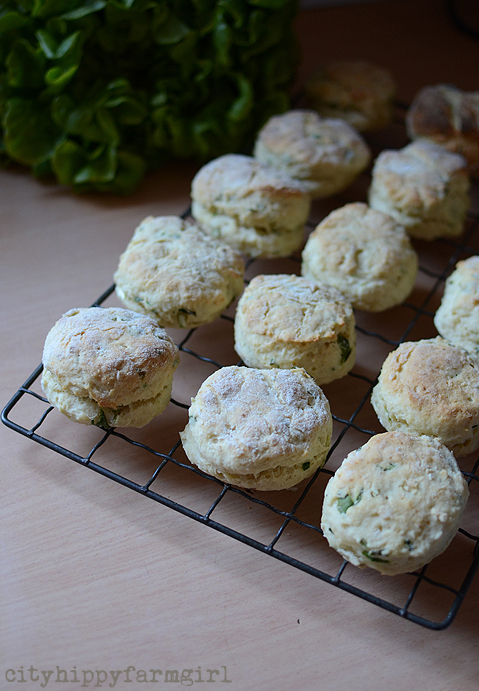 These look wonderful – suddenly Im thinking I need to make some chive scones to go with our chili tomorrow night. This just happened to a friend of mine. Her’s didn’t seem so bad, what a bummer that you had to pull them all out.